Ah, the dreaded bathroom mirror self-portrait. It’s an awkward and somewhat unsightly cliche, but I didn’t feel entirely comfortable asking a co-worker to photograph my [admittedly rather nice] gun show. 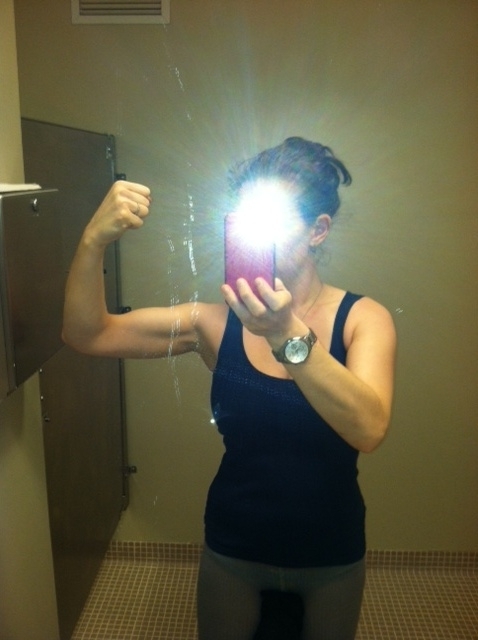 I’ve been training regularly, though, and poorly-lit pic aside I’m very pleased with my progress. While I’ve had some ups and downs with self-esteem and positive body image, I’ve always been happy with my ability to add muscle fairly easily. One of the most popular fitness myths is that a lady should avoid lifting large weights, lest she “bulk up” and look like a man. Well, unless your goal is to add a ton of muscle mass, and you’re planning your workouts and meals accordingly, it’s not going to happen. Even female power lifters, while typically ripped and well-defined, don’t get to the point of looking masculine or bulky. Ultimately, hoisting a pastel 4 lb. weight isn’t going to have the same health benefits as hauling around some serious iron, so why let an old superstition get in the way of your fitness? One of my favorite sources for weight-lifting facts is The New Rules of Lifting for Women. Strength and conditioning specialist Lou Schuler (together with fitness expert Alwyn Cosgrove and certified nutritionist/registered dietician Cassandra Forsythe) put together a program that combines strength training and conditioning moves, a sensible eating plan, and a good dose of myth-busting. Did you ever go to a Pilates class hoping that enough Hundreds would grant you the promised “long, lean” dancer muscles? Well, the truth is that your muscles are a certain length and thickness based on your genetic makeup. Nothing less than a medieval torture device will make them longer. Now, you can develop the tone of your muscles, and make your entire body leaner by decreasing your body fat percentage. I’m not terribly tall, meaning my muscles aren’t all that long, comparatively. But my muscles are well-defined, and I’m proud of that. Going beyond looks, my muscles are strong. I can squat and deadlift a respectable percentage of my body weight, or explode up into a high box jump. And that translates well to my martial arts practice: I may frequently be the lightest person in the room, but my instructors, training partners, and students don’t expect me to sit out a technique just because the other person outweighs me by 25 or 50 pounds. You’re not going to tell a mugger than they need to choose another target in their own weight class, are you? Plus the feeling of lifting and throwing a larger guy properly is a huge rush. I want to encourage everyone to get out of their comfort zone a little. There’s nothing wrong with a cardio program if you enjoy that type of activity and it works for you. But if you’ve been looking longingly at heavier free weights, and dream about loading up a bar, don’t let anything hold you back! There’s something truly empowering about checking yourself out in the mirror, liking what you see, and loving how you feel. One of my other weight-lifting lady friends and I even greet each other by flexing. Yes, in public. If you’re ready to challenge your preconceived notions of what exercising has to be like, step away from candy-colored weights and high reps. I’m not an expert, and all my advice comes from personal experience. But I’d be willing to bet most women are lifting far less weight than they’re actually capable of using. Start with a weight 5-10 pounds higher than your usual, and slowly go through a set of your favorite exercise. Pay close attention to your form! Try a few reps with heavier weights, gradually getting heavier, until you find a weight that you can move for about 12 reps, still using proper form. Start slowly– the only thing worse than undertraining is overtraining. You want to be able to go back to the weight room regularly, not sideline yourself with a pulled muscle or other injury. If you’re really a novice, work with a trainer first. There’s really no substitute for working in person with an expert who can correct your form and help you come up with a fitness plan that’s best for you. But I’ll bet you my favorite medicine ball that channeling your inner She-Hulk is going to be much more satisfying than tricep kick-backs with 3 lb. Barbie weights. Happy Friday! This has been a really exciting week for me. Last night, I had the privilege of attending an event hosted by C-CAP (Careers Through Culinary Arts Program). It’s an amazing organization that helps underserved students prepare for a career in the culinary industry. Some of today’s top chefs got their start through C-CAP, and the annual benefit is a showcase of talent and a chance to support the program. I’ll be posting a full review next week! After last night, I rested up and did some finger stretches for today’s treat: it’s Social Media Week in NYC and around the world, and I attended/attempted to liveblog (@toughcookienyc) a keynote talk on the new food role models (Chefs, bloggers, cookbook authors) and a debate on what makes a food trend (who’s kale’s PR rep?). The panels were fun and informative, and I got to meet a really friendly group of bloggers, chefs, and fellow food-lovers. We all agreed it was tough talking about food without having some snacks to carry us through the lunchtime stomach-rumbles! One aspect of the two events that I loved: it really brought home how food brings everyone to the table. And I think it shows that the sustainable/eco-friendly movement is much more lasting than a fad or a trend. Blue Hill and Oceana represented the local/seasonal and sustainable seafood aspects of cooking last night at C-CAP. Today, Bun Lai from Miya’s Sushi in New Haven, CT talked about growing his own seaweed and using invasive species rather than fish from faraway waters. Robyn O’Brien spoke on how her children’s allergies opened her eyes to how food and health are inextricably linked. I’m going to be exploring both events (and the interrelation between food and wellness) much more in subsequent posts. I’m also planning a visit to Miya’s with my mom– Chef Lai was thrilled to hear she’s a naturalist with an interest in invasive species, so we’re going to take a road trip for some sustainable sushi ASAP! Concentrating on how food can improve and enhance your life is probably the biggest, best This is Why You’re Fit I can imagine. We’ll just have to see how to keep raising the bar! What are some of your favorite foods for health, or wellness practices in your daily routine? We have timing issues with special meals. “First world problems,” you might scoff, and you’d be right. But when you’re planning a fancy dinner, timing is almost as important as taste! The night my mom first cooked for my dad and his family, the rice took so long to cook that they went out for a walk in between courses. In my case, the special dessert I had been planning refused to set, and so it’s been sulking in the fridge all day today. Luckily, I had just read a recipe for a One Bowl Chocolate Pudding Cake, which took minutes to mix and only half an hour to bake, so the evening ended on a sweet note after all. Dessert issues aside, last night I was given a wonderful gift– better than sushi, more precious to me than rare jewels or a set of really good chef’s knives. My husband elect said just one simple sentence: “that was the best steak I’ve ever eaten.” And he meant it, too. 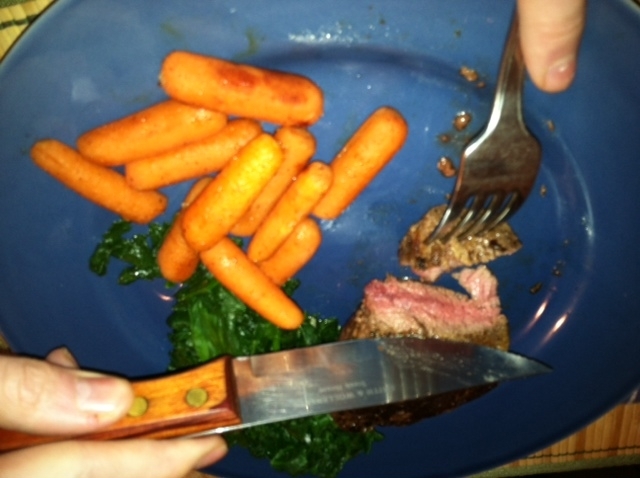 But before you protest that I just preached about making healthier choices, let me note that I didn’t just cook steak. Bison... it's what's for dinner! Although I don’t eat meat (other than fish), I’m very interested in new and exotic food sources. There’s a restaurant in our neighborhood that serves elk, bison, and ostrich, and choosing these lean proteins (less fat and cholesterol) can be one way to have your meat and eat it, too. I bought this filet from the friendly folks at Elk Trails Bison Farm, who sell at the Union Square Greenmarket. They certainly know their bison, and with good reason– they’ve been raising herds in Susquenhanna County, PA since 1985. The gentleman behind the counter confirmed that their Bison is free-range and grass-fed, and they use no antibiotics; he also gave me some cooking tips, which I followed to the letter. With the turf taken care of, I turned to thinking of surf. Lobster is the obvious special occasion equivalent, but it’s not actually my favorite. I’m much more of a scallop fan– they’re perfect little bite-sized morsels of protein, not to mention quick and simple to cook. And when you’re planning a special meal for a weeknight, there’s no shame in keeping it simple. Since our entrees were so simple, I kept the side dishes pretty low key, too: sauteed spinach with lots of garlic (it’s okay as long as both parties have garlic breath) and roasted [baby] carrots. I had completely forgotten to pick up carrots this week, so I resorted to using the baby carrots I usually bring to work to eat with some hummus! Shameful, I know. 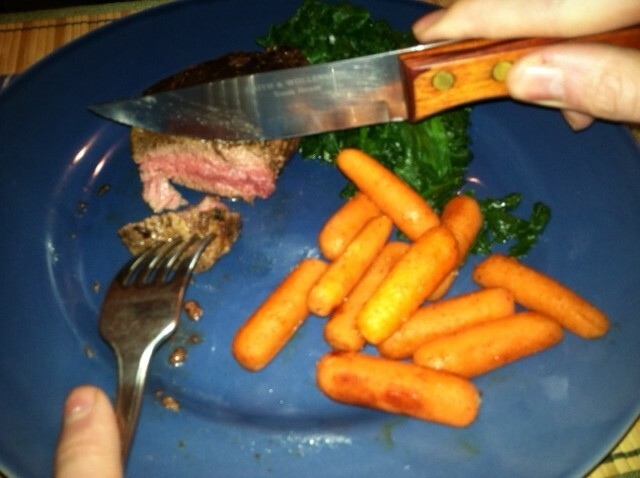 Luckily, the bison was so good that my baby carrot faux pas went unnoticed. The neat thing about bison is how quickly it defrosts. The packet of steaks I bought were frozen, so I asked how I would go about bringing one out of deep freeze. “An hour before you want to cook it, place the steak in two layers of plastic bags,” I was told, “then put that in a bowl of cool water and it’ll soften right up.” It worked! One note when cooking bison: because the fat content is so low, you need to be careful not to let the meat dry out/get tough. It’s actually better to cook the steak slowly over low heat (or “low and slow,” as they say in the biz) rather than sear fast in a really hot pan. 1 bison steak, roughly 8 oz. Rinse the steak under cool water, then pat dry. Rub with some olive oil, then sprinkle with salt and pepper. Heat a skillet over low heat, melt some butter into the pan, and add the steak. Cook on one side for 8 minutes, until a nice crust forms. Flip and cook an additional 8 minutes. Remove from heat and place steak on a plate; cover with foil and let rest 5-10 minutes. Add the juices back to the pan and reduce over low heat, then drizzle the sauce over the steak for added juiciness. You can flavor this liquid with wine or broth, or use it to cook mushrooms, onions, garlic, or anything that comes to mind. I kept it fairly plain to focus on the flavor of the meat. Rinse the scallops in cool water and pat dry. Heat a pan over medium heat and add the oil and a dab of butter; once the oil spatters when a few drops of water are flicked in, add the scallops. Grate some pepper and salt over the scallops, then resist the temptation to move them around in the pan. They need to develop a nicely caramelized seared top! 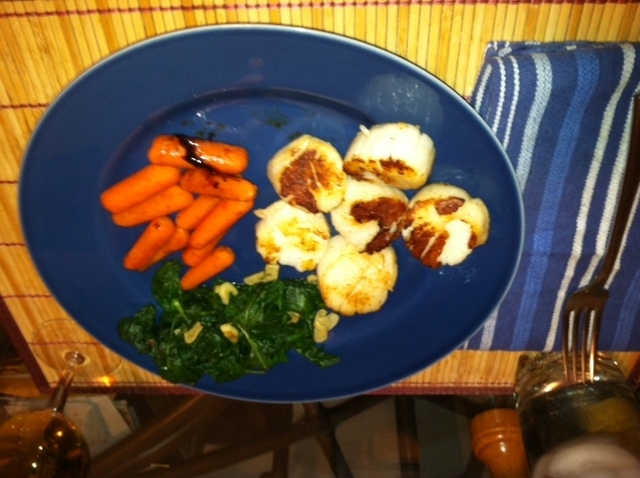 Scallops vary in size, so cooking time may not be uniform. Cook for 2 minutes, then gently peek under the edge of the scallops to see if they need to be flipped. If the scallop’s underside is nicely browned, it’s time to turn it over. Flip, cook for another minute, then serve immediately. They should still be slightly translucent in the middle. Preheat oven to 350. Toss the carrots with the olive oil, cider, and spices. Spread in a single layer and bake for 15-20 minutes, turning carrots over halfway through for even cooking. Carrots should be fork-tender. I’d love to go out on a high note with the elaborate dessert I made up, but it’s currently being a prima donna. I’ll try to update later, or maybe give it its own post tomorrow. In the meantime, I’d love to hear what you ate and/or cooked for your Valentine’s dinner! Greetings, lovebirds! The most (or least, depending on your cynicism) romantic day of the year has everything: hearts, candy, chocolate, flowers, and chubby flying babies with projectile weapons. V-Day doesn’t have much meaning for me, although I do enjoy any excuse to cook a special meal (stay tuned for that post tomorrow!). But I started thinking about how February 14 could be repurposed as a celebration of fitness instead of a day of sugar and dating pressure. One of my biggest inspirations for being healthy is my father. We’re a lot alike, actually– both stubborn, both happier when we’re exercising regularly. Dad kayaks every day, and goes for long walks when boating conditions keep him off the river. But he also has a genetic tendency toward elevated cholesterol and high blood pressure, which motivates him to stay active and make good dietary choices. The few times he’s had health issues, doctors have told him that his level of fitness probably prevented more serious complications. I can’t think of a better reason to start thinking about your long-term health than that. So my proposal for today is simple: don’t just tell someone you care about them. Show them! Take care of yourself, so you’ll be around and in good health for a long time. Instead of candy hearts, use this day as a reminder to think about your own cardiac system. Are you getting enough exercise? Choosing good fuel for your body? 1. If working out feels like a chore, partner up and have some fun. Try a game of tennis, or just go for a long walk in the park. 2. 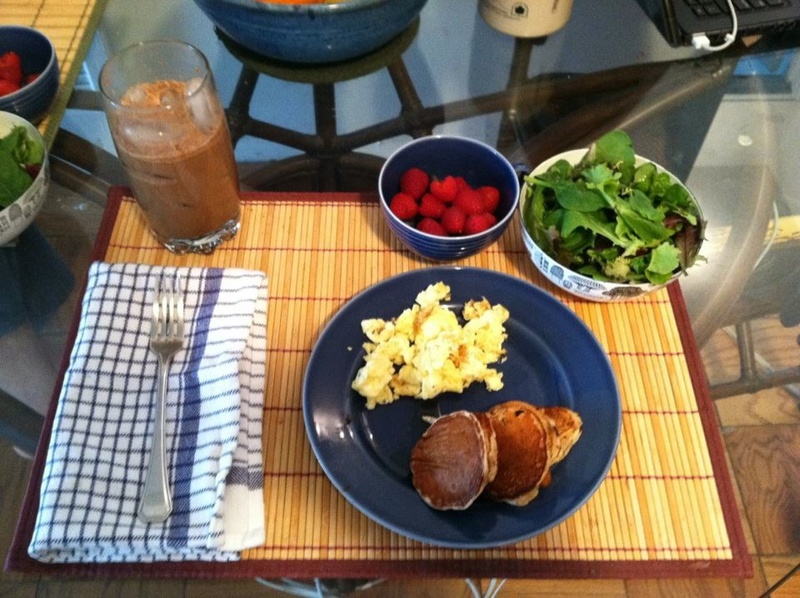 Instead of going out to eat, swap recipes and cook healthy meals together. 3. Give the gift of health! Instead of sweet nothings and empty calories, take your main squeeze salsa dancing. Or rock-climbing! Or if the fastest way to your spouse’s heart is through their stomach, surprise them with something delicious yet healthful, like a set of exotic spices. By this point in our relationship, my Husband Elect knows I don’t need flowers to feel adored, and I’m definitely not the “I love you BEARY much” stuffed animal type. He finds ways to express his love that fit both of our personalities, and that makes the gestures that much more thoughtful. This week I’m going in a million different directions: setting up wedding plans, taking a writing class, leaping tall buildings in a single bound. You know, the usual. One thing I haven’t been able to do is plan our meals for the week! I didn’t peek all morning, although the suspense made it hard to concentrate on my work. 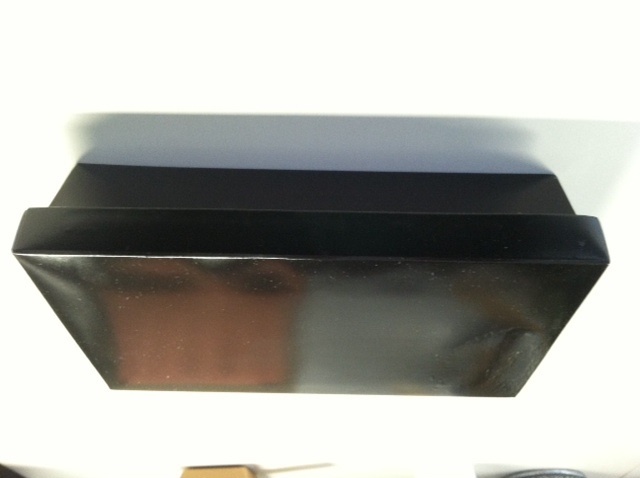 When lunchtime finally rolled around, I opened the plain white bag to find an equally plain black box. 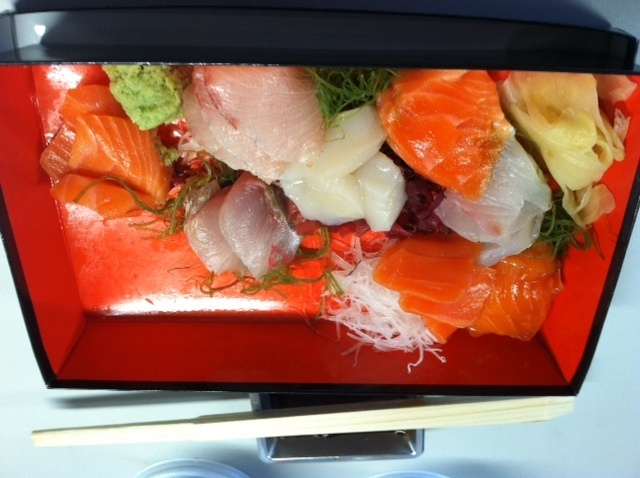 Not everyone would think to say it with sushi, but it was the perfect quick and filling lunch for a hectic day! Check back tomorrow, when I share how I returned the favor. All stressing aside, I really do love the holiday season. I’ve heard people say that you’re either a baker or a cook; I like to think that I’m both, but I certainly enjoy making baked goods for parties or as presents. As I’m a vegetarian, Thanksgiving is not really about turkey for me. Instead, I fill my plate with a variety of delicious and healthy family specialties: wild rice with mushrooms, green beans, fresh cranberry salsa, and baked sweet potatoes. 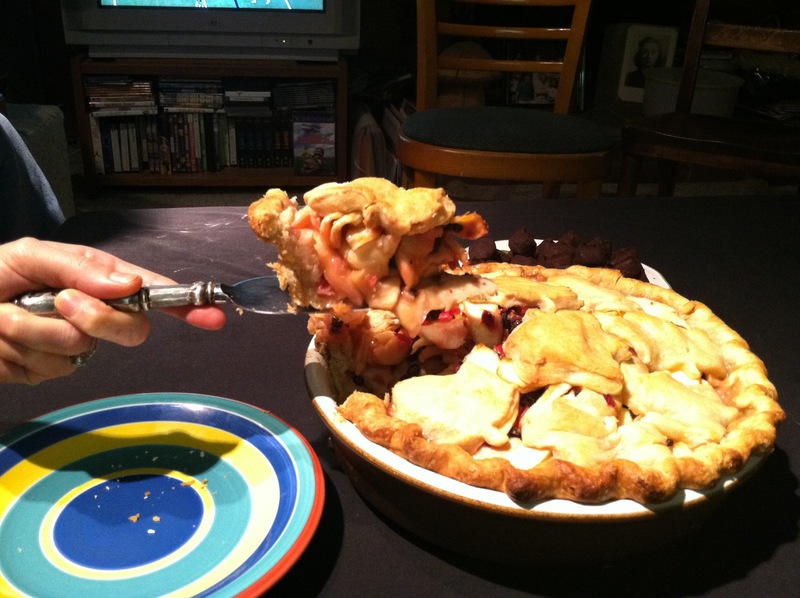 At some point, I want to go back and find pictures of each year’s pie and post a comparison series. I started out with a full top crust. A few years ago, I started using leaf-shaped cookie cutters to cut out the dough and scattering those pieces decoratively over the top. 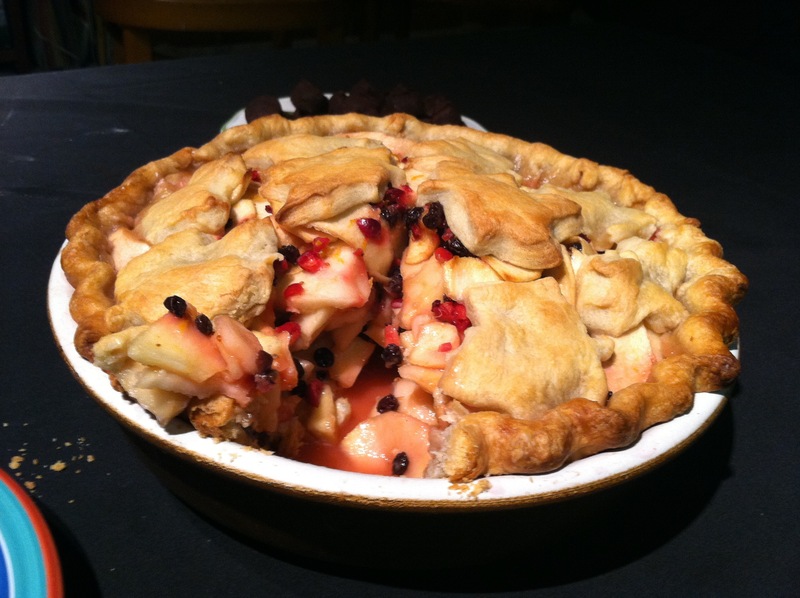 I like how the slices of apple, currants, and bits of cranberry peek through the crust. There are several schools of thought as far as pie crusts go. There’s the shortening school, the shortening + butter school, and the lard school. I tried shortening, but it has about as much flavor as paste. Maybe less. Lard is out for a number of reasons. And that leaves us with butter, which is never just a consolation prize. There’s a reason so many chefs cook with butter. It’s full of flavor and makes a tender, flaky crust just as easily as shortening. As in, don’t overwork your dough. The more you mix and blend, the less likely it is to stand up to your filling. Less work = more successful crust. When I make this pie, it never turns out the same way twice. Different apples, slightly different mixture of seasonings, a new ratio of dry to wet ingredients in the pie dough. It doesn’t need to be identical each time: just delicious. In a large bowl, combine the flour, sugar, and salt. Cut the butter into small pieces and work into the dry ingredients with a pastry blender. When the butter pieces are the size of small peas, stop blending. Add cider, a few tablespoons at a time, using a rubber spatula or your hands to gather the dough together. Stop after 1/2 cup and stir well; after that, add cider only a tablespoon at a time. Add a little flour if the dough gets overly wet. Cut the dough in half, wrap each piece in plastic wrap, and refrigerate overnight or at least an hour. The dough can stay wrapped and refrigerated for about a week. In the oven, position rack in the lowest third; preheat to 375°F. Place the currants in a small bowl and add just enough liqueur to cover. Chop cranberries with sugar, using a mezzaluna or food processor. Peel and core the apples, and cut into 1/2-inch thick slices. 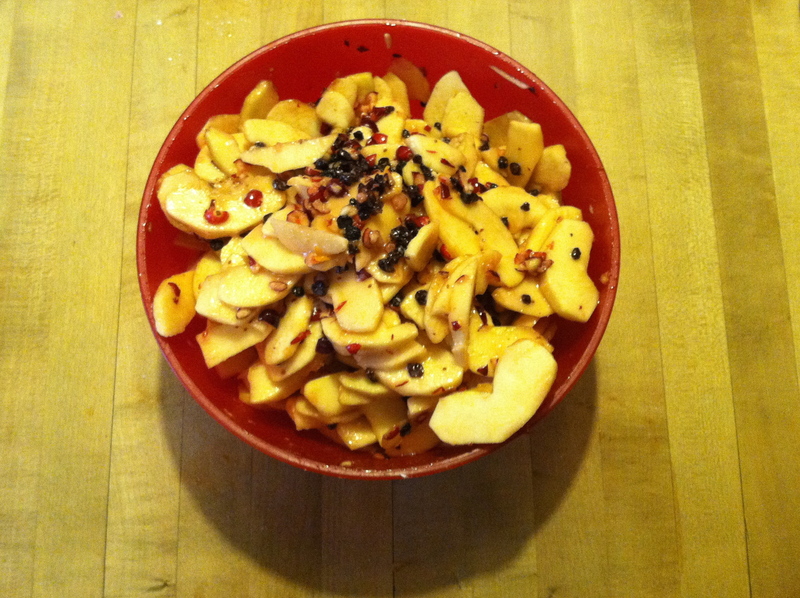 Combine apples, cranberry/sugar mixture, currants, and flour. (If using, zest orange into bowl; peel an inch-long piece of ginger root and press through a clean garlic press to get the juice.) Toss well. 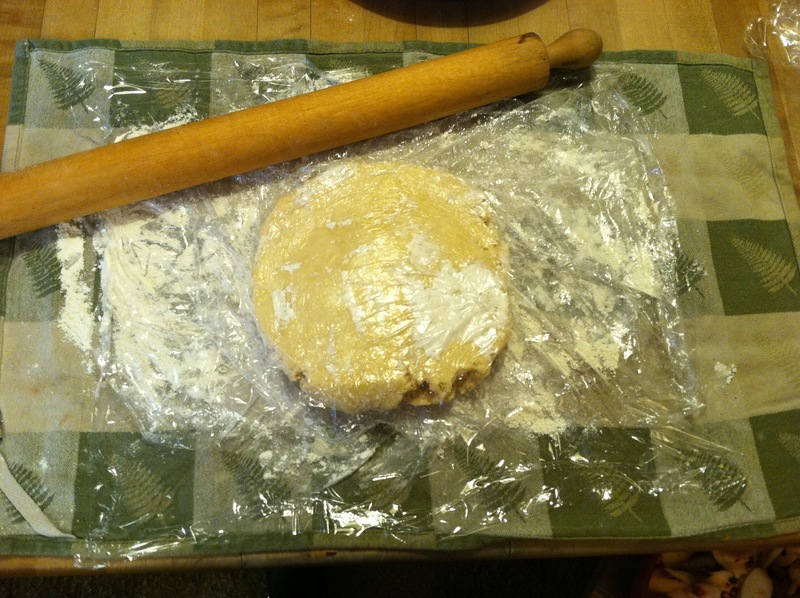 Roll out 1 of the pieces of dough between waxed paper or plastic wrap to 13-inch round. 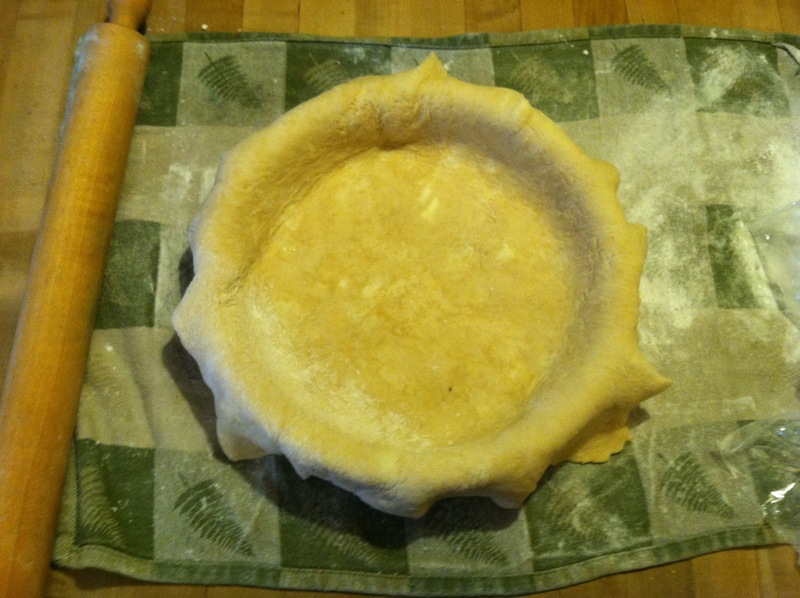 Gently peel off paper or wrap; fold edges in carefully to transfer into 9 1/2″deep-dish pie dish. I’ve found this is the easiest way to transfer the bottom crust into the pie dish in one piece. 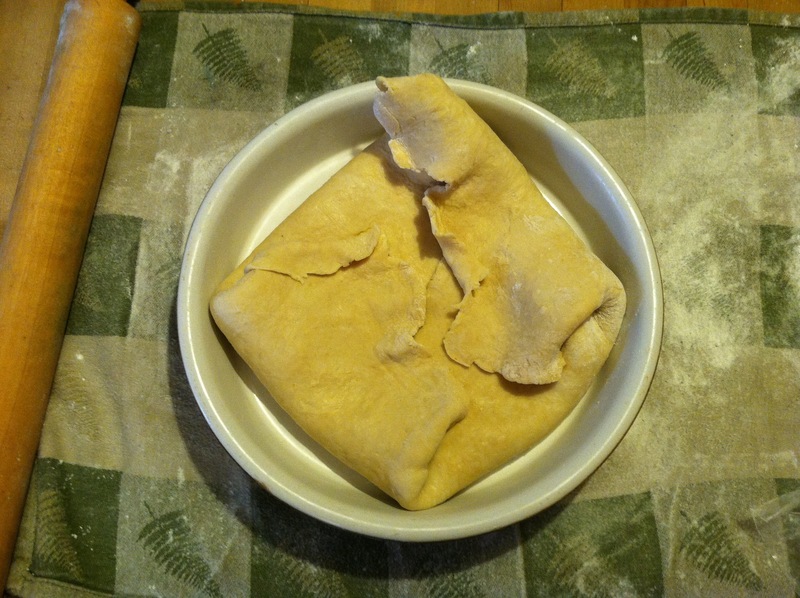 Unfold the dough; roll excess in to form a double-thick edge. Crimp edge. Roll out the remaining dough disk on a lightly floured surface to 1/8″ thick. Using a cookie cutter, cut out leaves, apples, or any other shapes you might like. If using leaves, mark veins with a sharp knife. Add filling to pie dish. 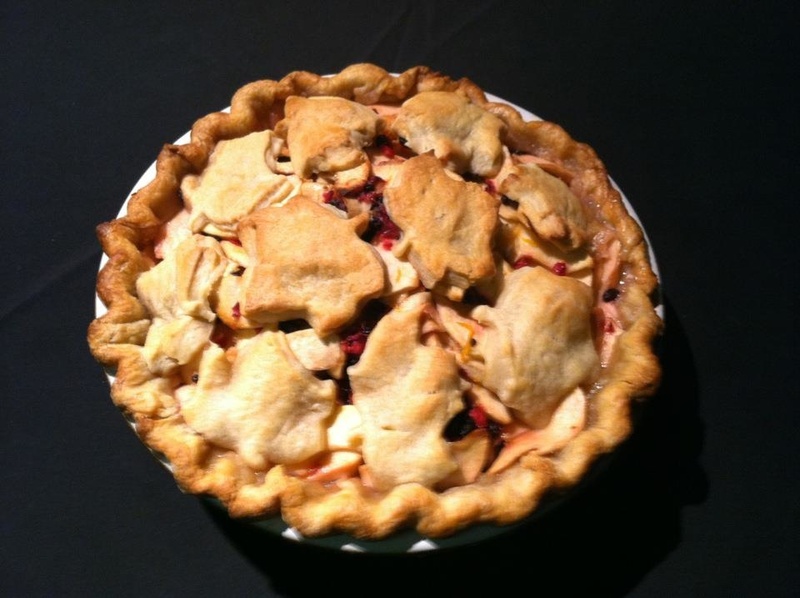 Arrange leaves around the edges and top of pie, overlapping in places. Do not cover completely: leave gaps. Brush leaf cutouts and crimped edge with cider. Place the pie on a baking sheet. Bake for 45 minutes, then cover with foil and continue baking for about 35 minutes more, until juices bubble thickly and crust is golden-brown. Transfer pie to rack and cool for 1 hour. Serve warm or at room temperature. Bon appetit! Or as we say around these parts: OM NOM.